This conference is a cornerstone to helping tech and business professionals understand and leverage Microsoft’s foremost collaboration platform. 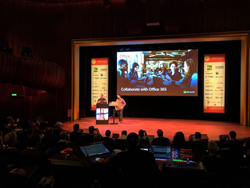 Following BWW Media Group’s acquisition of IT Unity and NC Communications and a successful UnityConnect conference this past November, the company announces the return of the Office 365 conference, Office 365 Engage (formerly European Office 365 Connect). This premier conference will take place 19-22 June 2017 at the Philharmonie in Haarlem, Netherlands. Office 365 Engage, a UnityConnect event, is Europe’s foremost conference on Microsoft’s enterprise collaboration platform. World-renowned technical and thought leaders will deliver keynotes, sessions, workshops, and panels that teach tech professionals how to solve Office 365 challenges and provide perspective on making the newest Office 365 features work for your business. Sponsorship opportunities provide engagement with IT pros, developers, and business professionals who are looking for enterprise collaboration solutions that can immediately address their business needs. To learn more about Office 365 Engage, please visit Office365Engage.com.